From the director of "Wild Hogs" comes a comedy sure to make every family member laugh. Best friends and bachelors Charlie (John Travolta) and Dan (Robin Williams) are about to have their worlds turned upside down when they are put in charge of taking care of six year-old twins, while at the same time trying to close a new business deal. Join the stellar cast of Matt Dillon, Seth Green, Bernie Mac and Kelly Preston as they embark on a new adventure full of debacles and a realization of what is truly important in life. One Can Relate to "Old Dogs"! 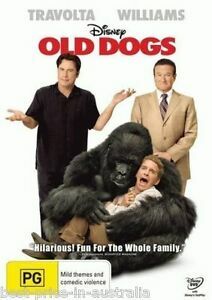 Wonderfully funny and entertaining DVD. Robin Williams is superb as is John Travolta. A great DVD to have in your at home collection.